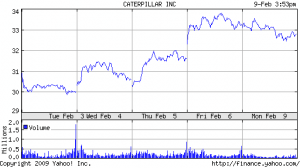 Caterpillar notched its first positive week of 2009 with a 7.8 percent pop from last Friday’s close of 30.85. There was no sane explanation for the three-day buying binge that got us here (today’s lame excuse: terrible unemployment numbers will hasten passage of the federal stimulus package. Right.). Full quote at Yahoo Finance. Major indexes closed in the green too: Dow, up 2.70%; Nasdaq, up 2.94%; S&P 500, up 2.69%. Wrap-up at Market Watch. 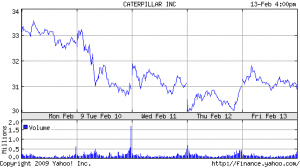 Volume in Cat shares of 16 million was down a bit from yesterday, but still well above average. Three days in the green on high volume suggests a lot of confidence in Cat’s prospects (though I can’t help wondering how much short-covering had to do with these big booster steps), and today’s close is well above yesterday’s $32 resistance level. Next week will be the test. 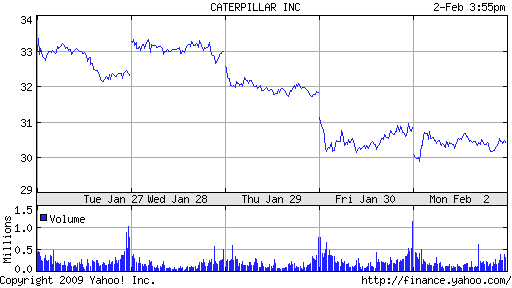 Caterpillar leaped out of the gate and climbed all morning, but profit-takers took some of the glow off by the day’s end. Financial and tech shares had a nice outing, too. Good day to be bullish; we’ll see how long it lasts. Full quote at Yahoo Finance. Indexes were all up: Dow, up 1.34%; Nasdaq, up 2.06%; S&P 500, up 1.64%. Wrap-up at Market Watch. 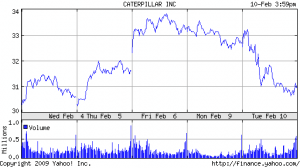 Caterpillar has had two green days in a row on above-average volume, though both days saw price seepage into the close. 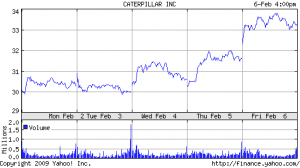 Check out Cat’s six-month chart at StockCharts.com and pay heed to today’s high, around $32 a share. Then look at the previous lows in October and November: also around $32. This is a classic bear market pattern: old “support” become new “resistance.” We need a strong surge above $32 to be confident that this rally has legs. 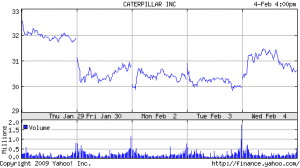 Finally, a burst into the green: Caterpillar popped at the open and climbed all morning, then proceeded to give back half of its gains in the afternoon as earning worries on the broader markets cut the wind from everybody’s wings. Full quote at Yahoo Finance. Indexes finished in the red zone: Dow, down 1.51%; Nasdaq, down 0.08%; S&P 500, down 0.75%. Wrap-up at Market Watch. 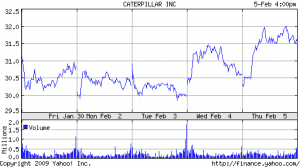 Trading volume in Cat shares remains about 40 percent above average, which normally would be a happy outcome on an up day. 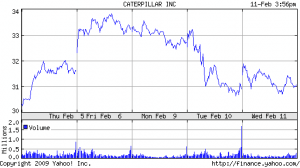 If you check the candlestick patterns on Cat, though, you see one of those inverted hammers that tends to predict more travels to the downside. I suspect once earnings season subsides and the river of bad news fades from the headlines, we might finally see a bit of a rally (barring further bank meltdowns, of course). Another of those “coulda been worse” days. 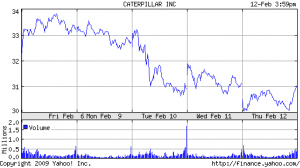 While the rest of the markets took a tentative march into the green, Caterpillar remained stuck in the red, probably because of the lousy Cummins guidance, though there’s some comfort in the shares not having set a new 52-week low. Full quote at Yahoo Finance. Cat’s been trading in a narrow band around $30 a share the past couple days and can’t seem to make up its mind where it wants to go, which seems odd in light of the 17.8 million shares traded. I have no sense of where things might be going, which is probably healthy because my senses tend to lie. 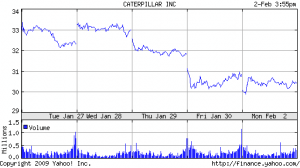 Like we needed proof a bear market is a bull going backward: Caterpillar set a fresh 52-week low out of the gate Monday morning, but rebounded a bit on news that the manufacturing sector’s performance in January was a bit less skunklike than it was in December. Full quote at Yahoo Finance. The indexes were mixed: Dow, down 0.80%; Nasdaq, up 1.22%; S&P 500, down 0.08%. Wrap-up at Market Watch. 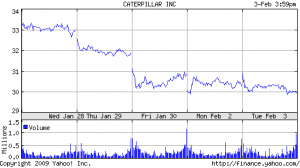 Cat’s volume at 16.7 million shares remains about 30 percent above average, which is not encouraging on a down day. Buyers keep dipping their toes in the water at $30 a share; I think it’ll be up to the rest of the market to give them enough confidence to dive back in.